Is Golf More Difficult Than Flying? Playing golf and “driving” a ball with some degree of proficiency is difficult, and almost as time-consuming to perfect as “driving” a plane. For one, the rules of golf do not permit “Artificial Devices and Unusual Equipment which might assist [the player] in making a stroke in his play,” which essentially means that golfers don’t get the benefit of autopilot. Second, golf requires a person to stroke an object (the ball) with another object (the club head), which is attached to the end of a 40-inch shaft (+/-5 inches). This action must be performed so precisely that the ball will fly approximately 280 yards in the air, within a horizontal window of 4 degrees from the launch pad, and stay in the fairway (short grass)…only so you can find it and repeat the process with another club, resulting in a completely different trajectory. Swinging the club with some degree of consistency is enough of a challenge. Never mind making contact with the ball at precisely the right point on the clubface in order to achieve maximum distance. But these challenges are just part of what makes the game so addictive. The complex science of aerodynamics can help us understand precisely how the air flows over the surface of the ball, allowing it to fly through the air like a plane rather than take on the trajectory of a bullet. In fact, a golf ball can travel farther than any other round object of the same size and weight launched under the same conditions. A lot is known about how air flows over a wing, but less about how it flows around the wing tips, where it is believed the trailing vortices begin. The type of turbulence and aerodynamic forces created in this area are complex. Some have even compared the airflow surrounding a spinning golf ball to the dynamic reaction of two wing tips meeting. Does this mean that a golf ball is in part more complex aerodynamically than the Falcon 7X, Boeing 777, or even the Concorde? The only thing that makes the golf ball a little easier to study is that it doesn’t get into the supersonic range, although it may seem like it does when John Daly or Tiger Woods hit the ball. 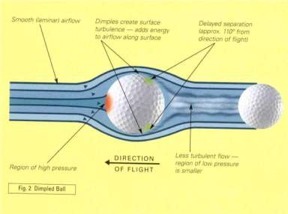 It is the dimples (surface treatment) on the golf ball that are responsible for its flight characteristics. 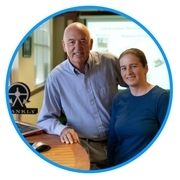 Their design (i.e., size, shape and pattern on the surface of the ball) will help dictate the ball’s trajectory. Some 600 years ago, someone observed that an older, used ball with a roughened surface performed better than a new, smooth one – hence the origin of “dimples.” As ball construction evolved from a stitched pouch of skin stuffed with feathers to the molded, solid, natural rubber (gutta percha) ball introduced about 150 years ago, a roughened surface was recognized as an integral part of the design, even though it was not understood why or how it worked. In 1672, Newton recognized that transverse forces existed when spinning tennis balls flew through the air. Magnus explained these forces in the 1740s, and their effect bears his name. Then, in 1890, Professor Guthrie Tait of Edinburgh University was the first to study and describe his basic understanding of the aerodynamic principles of a golf ball. He, too, recognized that the rough surface, in combination with backspin (underspin), created lift (Magnus force). This allowed the ball to travel farther than a smooth ball launched at the same speed and launch angle without spin. As soon as a golf ball is launched off a driver, it starts its trajectory straight down the runway (fairway) with lift forces greater than the weight of the ball and drag forces that will immediately start slowing it down. Yet, it is still able to cover a distance of approximately 265 yards in the air and then bounce and roll on to about 290 yards in total. A smooth ball with otherwise identical physical properties, launched in the same manner, will only travel about 140 yards. The reason for this is that when the golf ball passes through the air, the roughened surface creates a layer of turbulence at the surface of the ball. As it spins, the surface air is dragged around the ball, creating a profile of disturbed air similar to an airfoil. This then works the same way as a very short (front to back), stocky wing, creating the lift force which allows the ball to stay in flight for longer periods of time than a smooth ball. It is unfortunate that these same forces, which create lift, also create a hook and slice (an undesirable deviation left or right of the target) when the axis of spin is tilted to the left or right. Wind tunnel experiments show that the simples on a nonspinning golf ball actually decrease the drag force, allowing the ball to slip through the air with less resistance than a smooth ball, but only at speeds between about 55 mph and 300 mph. Below 55 mph, both the smooth and dimpled balls slip through the air with about the same resistance (drag force). It is at the critical speed of about 55 mph that the nonspinning, dimpled golf ball passed the critical “Reynolds number” (aerodynamic jargon for “force barrier”), reducing the drag force significantly. The smooth ball goes through a similar force barrier, but at a critical speed of about 300 mph, and at this speed has less drag than the dimpled ball. 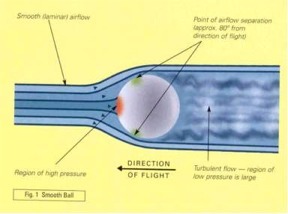 It is at these critical speeds that the drag tail (turbulence behind the ball) suddenly decreases in size. The separation point of air causing the turbulent tail or wake rapidly moves from a point about 80 degrees from the air flow direction to about 110 degrees around the back of the ball. This is sometimes referred to as “delayed separation” (see illustration). When this happens, the drag force decreases by almost 40% of that just prior to this critical speed. The drag force on the golf ball will then slowly increase as the speed increases. A golf ball well-struck off a driver is launched at about 160 mph and lands at about 70 mph. Thus, the ball would be in this decreased drag zone for most of its flight, taking advantage of the phenomenon. Unfortunately, golf balls are required to spin to achieve the Magnus effect, allowing them to stay in the air for six to seven seconds (average drive hang time). In addition, spinning balls do not have these clean and well-defined force barriers because the air flows over different parts of the ball at different speeds, which complicates airflow patterns. However, the dimpled ball, even in its spinning mode, has less drag resistance than a smooth, spinning ball. Designers have taken an experimental approach and have analyzed the cause and effect of a variety of designs in search of the “perfect dimple,” which will result in an optimum trajectory. The formal trial-and-error method examines variables such as dimple shape, number, pattern and surface-area coverage, as well as simple depth, ratio of depth-to-surface area and even the smoothness of the dimple surface. However, most designers believe that there are only + / - 4 yards left in optimizing the aerodynamics of the surface. The Ball is Going too Far? For the last 100 years, golf’s governing bodies have been concerned by the continual improvement in distance that balls have gained through technological research. By 1976 the “Overall Distance Standard” (ODS) was adopted. The standards were based on launching a ball using a mechanical golfer to simulate real field conditions and setting a limit on the distance under specified test conditions. Individual properties of the ball, which contributed to the overall distance, were not isolated or limited for two reasons: first, they were not understood; nor were they able to be measured at the time. Things have changed since, and the USGA has perfected the “Indoor Test Range” (ITR) which supersedes a wind tunnel and force-balance system to measure the aerodynamic properties of a ball. The ITR is a 70-foot-long open area with a series of stations along its length. At each station, the exact ball position and speed are measured as it passed by. This method of firing a spinning ball through a still body of air has proven to produce far more accurate and reliable data than trying to support a spinning ball in a laminar stream of air in a wind tunnel. From the information collected in the ITR, the coefficients of lift and drag for a number of different speeds and spin rates are calculated and combined for use in a simulation to describe the complete trajectory of any golf ball tested. To further match the optimum launch conditions with the golfer, club design is changing in order to reduce the spin rate, launch the ball higher and launch it with more speed. The spring-like effect has been a major advance in club design. Titanium clubs with shell-like hollow heads and thin faces, which deform and recover during impact (impact time, while the ball and club are in contact, is about .000450 of a second), enhance ball speed by increasing the “Coefficient of Restitution” (COR). Unfortunately for many golfers looking for an extra thirty yards, the laws of physics will limit the distance balls can travel to only a 10- to 15-yard improvement – even without existing performance standards! In other words, equipment is reaching its limit.